What a month for publications it has been, it seems that all the fruits of my major paper-writing push last year, which incidentally explains the quiescence that Dracovenator experienced, have ripened at the same time. First was the short Massospondylus neotype paper. Following hard on its heels came the long awaited basal sauropodomorph pneumaticity paper which has already showcased on SV-POW and Jurassic Journeys. Just this week has seen the electronic publication of a third paper of mine, this time on bivalve molluscs and finally a fourth (sauropodomorphs once again) is expected fairly soon. However it’s the pneumaticity paper that I want to talk about today. Indeed it’s a paper I’m very proud and there is a load of stuff in it that I want to cover here in a bunch of posts. For now I’m just going to highlight a simple point from the paper: pneumatic structures can be well hidden, even on apparently well-prepared specimens. At this point I should probably introduce what pneumaticty, or more specifically postcranial skeletal pneumaticity (PSP), actually is. Put very simply some vertebrates have thin-walled and air filled extensions of the lung that can can actually grow through the body. When these extensions, called diverticula, reach bone they can actually enter it, hollowing out the bone forming structures hollows and chambers that we describe as pneumatic. One might think that great big air-filled hollows invading bones would be easy to spot, and certainly in their advanced state they can be but not always. Take the vertebrae of Antetonitrus for example. This is what one of the mid posterior trunk vertebrae looked like before this study began. 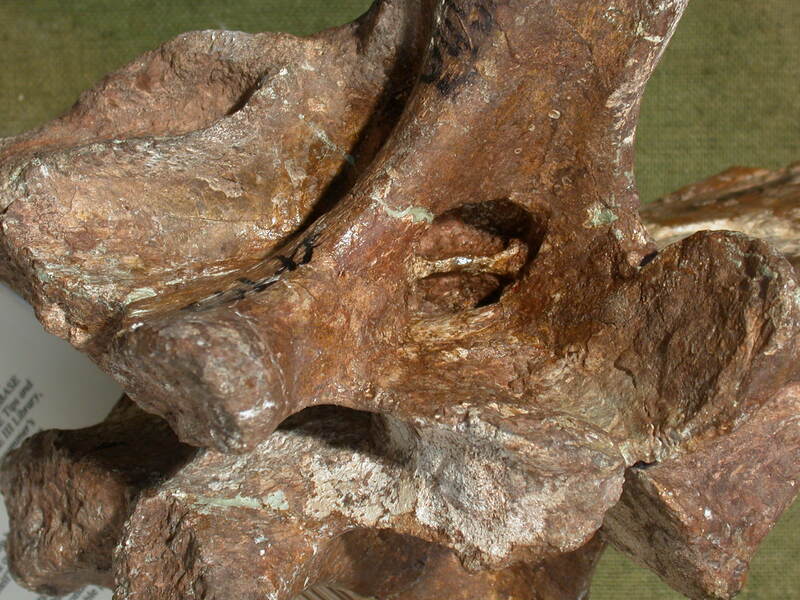 A posterior trunk vertebra of Antetonitrus with the posterior infradiapophyseal fossa identified. Note the small patches of matrix left on walls of these hollows. What could they be hiding? It looks rather simple and there is no sign of any sign of pneumatic chambers excavating the bone. 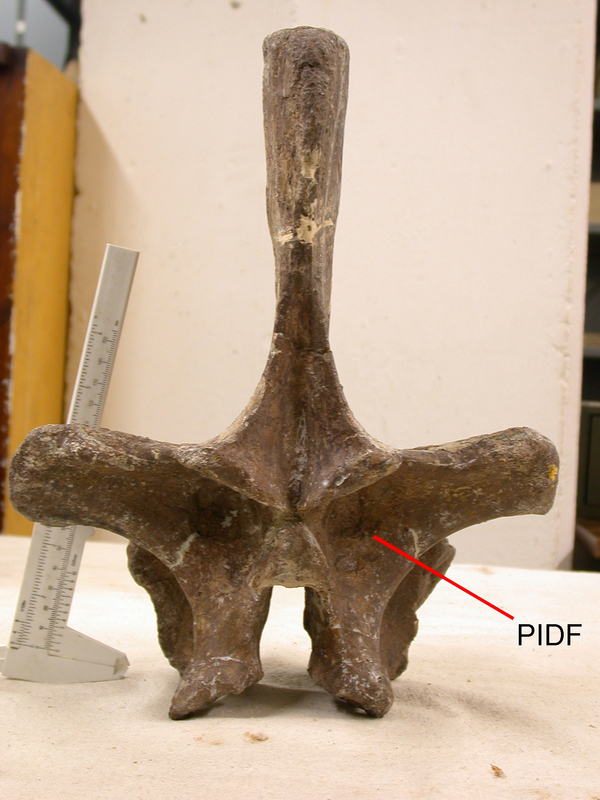 But, and its hard to see on these before photos, there was a little bit of matrix stuck at the back of the hollow that is labeled the PIDF in the photo (PIDFstands for posterior infradiapophyseal fossa – you’ll forgive if I continue to call it the PIDF). Given that the PIDF of our newly found sauropodomorphs from Spionkop often had structures recessed deep in the PIDF I wanted that last bit of matrix cleared away. What emerged was pretty impressive. In the words of Matt Wedel, a co-author on the eventual paper “those chambers rock!”. They were especially cool because t had long been thought that the earliest sauropods weren’t pneumatised but I think this evidence is pretty incontrovertible. Might other basal sauropodomorphs have hidden pneumatic features tucked up into their pidfs? I’m sure of it. Camelotia for one certainly has something going on and love to be given the chance to properly check basal eusauropods like Shunosaurus. Take home message is that an apparent lack of pneumatic features must be carefully examined before they can be dismissed as absent. I’m very grateful to have been involved with this paper — I’m biased for sure, but I do believe our manuscript has important ramifications for dinosaur evolution. Hi, My name is Adam Yates. I'm an Australian palaeontologist living and working in Johannesburg, South Africa. I'm one of the lucky few who were able to turn a boyhood passion for dinosaurs into a career. The largest ‘prosauropods’ – part 3.
wordpress hosting on Earth Claw is here!